The rising concern related to the greenhouse gas emission and long-term cost assistance provided by electric bus is alluring transit agencies to adopt electric and hybrid bus. Air pollution is one of the leading causes of death in numerous countries, according to a report by World Health Organization (WHO). Every year about 90,000 deaths in Europe occur due to air pollution. Due to the negative impact of air pollution, the governments around the globe have started investing heavily in reducing pollution. Countries such as China, France, the U.K. and Germany are some of the early adopters of the electric and hybrid buses. Goldstein Research analyst forecast the electric and hybrid bus market sale is projected to reach 40,061 units by 2024, at a CAGR of 25.3% over the forecast years. The transit agencies in developing countries are focusing more on long-term environmental and cost benefits. The report covers the present ground scenario and the future growth prospects of the electric and hybrid bus market for 2016-2024 along with the new market players entering in the global electric and hybrid bus market. We calculated the market size and revenue share on the basis of revenue generated from major players across the globe. 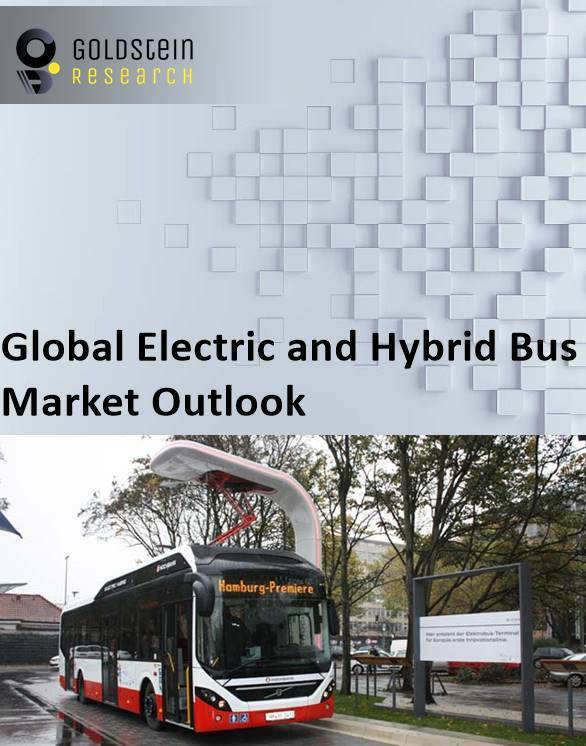 Global electric and hybrid bus market report by Goldstein Research has been prepared based on an in-depth market analysis from industry experts. The report covers the competitive landscape and current position of major players in the global electric and hybrid bus market. The report also includes Porter's five force model, SWOT analysis, company profiling, business strategies of market players and their business models. Global electric and hybrid Bus market report also recognizes value chain analysis to understand the cost differentiation to provide a competitive advantage to the existing and new entry players. Our report comprises of the following companies as the key players: AB Volvo, Zhengzhou Yutong Group Co. Ltd., Shenzhen Wuzhoulong Motors Co. Ltd., Daimler AG, BYD Company Limited, King Long United Automotive Industry Co. Ltd., Alexander Dennis Limited, New Flyer Industries Inc., EBUSCO, Solaris Bus & Coach S.A., and Proterra Inc.
On the basis of vehicle type, urban buses are having the highest market share of 41.0% owing to high demand by daily travelers. Every day almost 5.63 billion people use the urban buses and this sector will dominate the market in future as well. Whereas, on the other hand, the market share of touring coaches is growing steadily at a market share of 21.90% as the tourism is increasing day by day. The tour and travel activity generates the revenue of USD 3288 billion across the globe which will drive the market of touring coaches of the global bus market. Based on geography, Asia Pacific dominated the global electric and hybrid bus market with the market share of 51.2% in 2016 owing to increase in urbanization and rising population. Countries such as China and India have the global market share of 22.0% with more than 80,000 units being acquired. North America is growing steadily with the market share of 32.1% due to increase in the concern related to the environment and the US government taking initiatives to shift their public transportation systems to zero emission vehicles. According to the report, major driving factor for electric and hybrid bus market is the increasing number of venture funding in the global electric and hybrid bus market. Though this market is still in its budding phase and requires more technical development for its increased adoption. Many players are investing almost USD 30 million to USD 120 million in the global electric and hybrid bus market. Further, the report states the major challenge is the long charging, it takes around ten hours to charge a normal 15kWh battery in a standard 120-volt outlet. Another major challenge in the global electric and hybrid bus market the cost of the batteries fitted in the buses. In the US the battery costs around USD 300 per kWh. Battery cost still is above the target even if the battery makers can meet the technical challenges which are hampering the global electric and hybrid bus market. What is the revenue of electric and hybrid Bus in 2015-16 and what would be the expected demand over the forecast period?